You may love all the potted plants that you have around your home, but you don’t enjoy all the plant bugs that you always find yourself swatting away from your face. Dealing with gnats in plants can be incredibly frustrating because it seems like you can never honestly get rid of them. 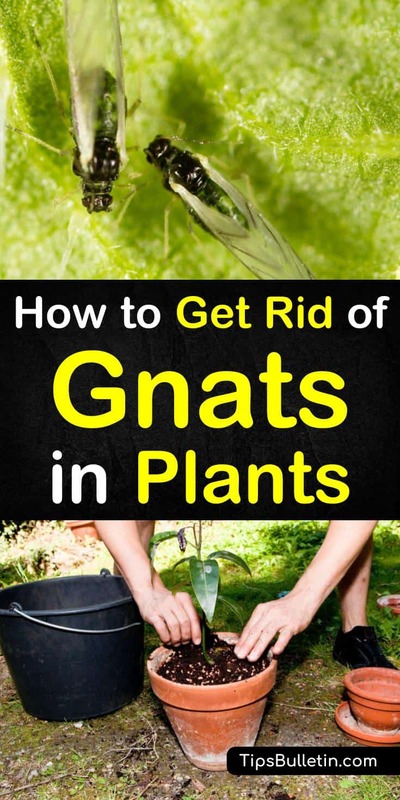 The good news is you can learn how to get rid of gnats in plants with a few household products and keep them at bay with a few simple changes to your environment. Getting rid of fungus gnats doesn’t mean you have to rid your home of potted plants. You can control fungus gnats, both inside and outside with a few simple solutions. Fungus gnats are attracted to the moist soil of your houseplants. The adult female gnats will lay eggs on the top of the ground. When the gnat eggs hatch, the fungus gnat larvae will feed on the plant roots and decaying organic matter until they enter the pupae stage, before becoming adults. Even though their life cycle is only around four weeks, female adult fungus gnats can lay up to 300 eggs on the top of the soil during their life, quickly leading to fungus gnat infestation if not treated. How Do I Get Rid of Plant Flies on my Indoor Plants? If you are dealing with an infestation of plant flies, you can effectively get rid of them without having to get rid of your indoor plants. The first thing that you will need to do to get rid of these houseplant pests is to remove the top two inches of soil from each house plant. Since fungus gnats like to lay their eggs in moist potting soil, this will remove the gnat problem before the plant pests can hatch. After you remove the top layer of soil, fill your pots with new potting soil. If you don’t want to take the time to remove the potting soil, you can also make a soil drench with hydrogen peroxide and dish soap. Pour it over the potting mix at the plant roots, until it starts to come out of the base of the pot. It is safe to use hydrogen peroxide for plants and will effectively kill adult gnats and their larvae. Another practical solution that will get rid of gnats in plants in your home is to make a trap using apple cider vinegar. Pour some vinegar into a shallow bowl and add a few drops of dish soap to the mix. Place some plastic wrap over the top. Use a toothpick to punch several small holes in the top of the Saran wrap. The cider vinegar will attract the gnats to the bowl. When they fly into the liquid, they become covered in the dish soap, which leaves them unable to fly, effectively drowning them in the fluid. Another way to get rid of gnats in plants is to spray an insecticidal soap solution on your plant leaves. Both homemade and commercial insecticidal soaps contain fatty acids that will dissolve the exoskeletons of gnats while disrupting the cell membrane of the insect. Combine the ingredients in a large container, mixing well. Pour the mixture into a spray bottle, and spray the undersides and tops of the plant’s leaves and stems. Spray the mixture around your windows and doors and in any cracks and crevices that might allow gnats to gain access into your house. Finally, you can use yellow sticky traps to get rid of fungus gnats from your plants and fruit flies from your kitchen. You can either purchase these from your local store or create your own using colored paper and honey. Cut medium-sized strips from the colored paper and smear one side with honey. Lay the fly traps near your plants and the small flies will become trapped in the honey. Are There Natural Solutions to Get Rid of Fungus Gnats Outside? 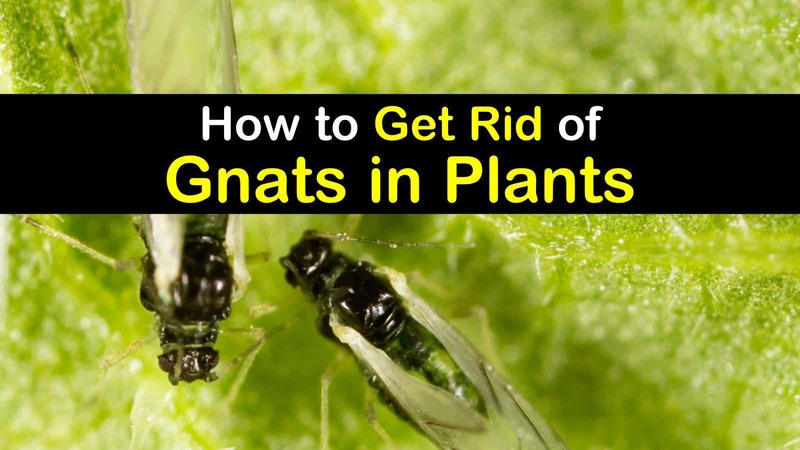 Gnats won’t only cause you issues inside your house, but can also take over your yard, and destroy your tomato plants and other vegetables and fruits in your garden. An effective way to get rid of gnats outside is to introduce natural predators of fungus gnats to your garden. Beneficial nematodes are often used for organic pest control of a wide variety of pests, including gnats, fleas, grubs, and many more. There are also several biological pest control methods that you can employ that will rid your garden and yard of fungus gnats. The naturally occurring soil bacterium known as Bacillus thuringiensis will kill the larvae of fungus gnats, mosquitoes, and black flies. Hypoapsis miles and mites are small, brown mites that live in the top ½ inch of soil and are natural predators of the fungus gnat pupae. Diatomaceous earth is a natural pesticide that prevents gnats from laying their eggs and allowing their larvae to hatch. Sprinkling DE in your garden will kill adult gnats before they can lay their eggs. There are also many plants that you can place around your yard to keep gnats and other plant bugs at bay. Along with keeping gnats out of your yard, these are also the best mosquito repellent plants to have around your house. While the scent of these plants is extremely appealing to humans, gnats and other insects can’t stand the smell and will keep far away from the offending plant. What are the Best Ways to Keep Gnats at Bay? Once you’ve taken care of these pesky insects with the above remedies using everyday household items, you’ll want to take the necessary steps to continue to keep flies at bay, so you don’t end up with another gnat infestation. There are several simple pest control measures that you can regularly employ to prevent the pesky fungus gnats from becoming a problem again. When you purchase new plants from a store, make sure to carefully inspect the plants for plant pests before bringing them into your home. As an added precaution, you should consider repotting new plants with fresh potting mix, as this will keep you from bringing eggs and fungus gnat larvae into your home. When it comes to the plants that you already have, you want to make sure that you aren’t overwatering the plants. When you overwater your plants, it can lead to the roots, stems, and crowns of your plant to rot. Fungus gnat larvae thrive on this rotting plant matter, which can quickly lead to another infestation of tiny flies. Finally, to help keep gnats from finding their way inside your home, make sure to seal up any cracks and crevices around your doors and windows, and make sure there are no holes in your window screens. Make sure you don’t keep old garbage lying around your house and don’t let dirty dishes sit in your sink. Getting rid of pesky plant bugs is easy to do. With the help of a few household items, you can effectively rid your home of these tiny flying insects. If you are dealing with a gnat infestation, you can take care of the problem without getting rid of your houseplants, with these simple solutions. We hope you learned a lot about how to get rid of gnats in plants with the Q&A article. If you found the information useful, please feel free to share it with your family and all your friends.